In this article we would like to explore one approach toward problems of social engineering and to see how it might apply to the kinds of problems we find in the school setting. Suppose, for example, we feel that there is not enough teacher-pupil planning in the classrooms in our high school, and we want to see a change from the more teacher-centered methods of working with a class to methods using more pupil participation in planning. As a group of interested teachers, how can we begin to tackle a problem such as this? There seem to be four general steps which must be taken if the changes which are desired are to be effected: (1) Analyzing the present situation (2) Determining the changes which are required, (3) Making the changes indicated by the analysis of the situation, and (4) Stabilizing the new situation so that it will be maintained. Let us look at these steps in detail to see what they may imply. At first glance we oft feel that the present condition exists because no one has the energy to make it any different—there is just too much “inertia.” Yet, as we explore further it becomes clearer that there may be some very strong forces preventing substantial changes of any kind from occurring, [as well as equal forces pressing toward change]. In our example, there might be several forces which point toward more teacher-pupil planning in the classroom: (a) a generally progressive philosophy of education may be accepted by a large number of teachers; (b) the teachers want to train students in the ways of living as citizens in a democracy; (c) the pupils desire some freedom in making decisions. But there are also some forces which seem to be opposed to changes in that direction, such as: (a) many teachers lack training and skill in methods of planning cooperatively with pupils; (b) leaving the present methods and experimenting with the “unknown” makes us, like anyone else, feet insecure (c) criticism may be directed against the school by the more conservative parents; (d) pupils have little skill in planning together. Forces like these which oppose each other determine the present level of methods which are used in the classroom. Forces such as those above seem, to be of two kinds. Driving forces are those forces or factors affecting a situation which are ‘pushing” in a particular direction; they tend to initiate a change and keep it going. One's desire to be a more effective teacher is an example of a driving force; one is continually trying to improve regardless of his present skill. Restraining forces may be likened to walls or barriers. They only prevent or retard movement toward them.... Any lack of skill we may have in using teacher-pupil planning methods in the classroom may be termed a restraining force against practicing this method. As we see later, these two types of forces become particularly important when we attempt to stabilize a new condition to be sure it is continued. A group of forces such as are shown in Figure I may be called a "force field". 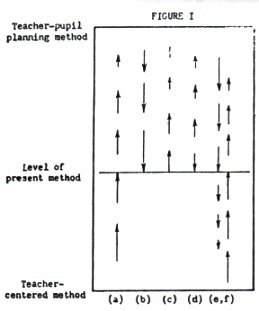 The top of the figure may be designated as teacher-pupil planning method, and the bottom of the figure as teacher-centered method. The arrows pointing downward represent the restraining forces which are keeping the methods from including more pupil participation and the driving forces toward more teacher-centered methods. The arrows pointing upward represent the restraining forces which are keeping the methods from becoming more teacher-centered and the driving forces toward more pupil participation. The length of each arrow represents the relative strength of the force at that particular point—the longer the arrow the stronger the force. As we see, the force field is made up of several forces of varying strengths which oppose each other. The strength of a particular force may itself vary at different levels (force (a) in Figure 1 us weak at levels near teacher-pupil planning but strong~ at levels near teacher-centered method). The present condition (the present level of the method) is at that level where the sum (of all the downward forces and the sum of all the upward forces ) are equal. changing the direction of the forces. In our example, one important force which almost necessarily requires reduction or removal is lack of skills in ways of using the methods of teacher-pupil planning. As we increase our skill in these methods, we will, in effect, be reducing or removing a restraining force like (b) from being effective at the present level.